From our law office in Mineola, New York, the attorneys at Greebel & Greebel serve a diverse range of clients throughout Nassau and Suffolk counties and the rest of Long Island by providing exceptional counsel, advocacy and support for their most challenging and pressing legal issues. 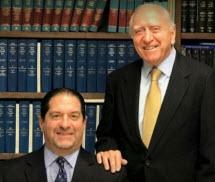 Our founding attorneys, Lawrence and Mitchell Greebel, each possess decades of experience in various legal areas, and we possess the skills and resources necessary to help you achieve the best possible outcome for your situation no matter how complex. Working closely with you, we endeavor to devise solutions that are tailored to your specific needs and goals, and we promise to remain accessible to address your questions and concerns as they arise. Along with maintaining a successful legal practice, we give back to our local community through our involvement with various charitable and civic organizations, and this has helped us earn our reputation as one of the top full-service law firms in the region. For more information on how Greebel & Greebel can help you protect what is most important to you while helping you secure a brighter future for yourself, your family and your company, you can contact our law office to schedule a free initial consultation.